Start by having the students hold their brushes lightly in the hands and mimic right to left strokes in the air or back and forth. Discuss proper treatment of their brush (best friend) and not to push it into paper or press too hard on it. Tell them about a horizon line and how it separates the top from the bottom or the sky from the ocean. Then start with your light color (yellow with a little bit of white) and paint the horizon line around the middle of the paper. Then paint yellow from the middle of the paper to the top. Next take your blue (or turquoise or mix white with the regular blue) paint and go from the middle to the bottom using proper brush strokes. 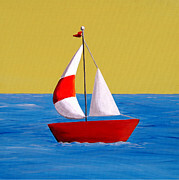 Set aside large background sheets and start working on boats. Take red tempera and paint boat structure and set aside. Have students cut out one large and small triangle with white tissue paper. Then have them cut out red rectangle out of tissue paper. Then have them cut out a small flag out of red construction paper (or foam).